So, now we have a new female Doctor, though by no means the first female Time Lord, but by placing Jodie Whittaker as the thirteenth Doctor, the show has opened up many possibilities. Although, not noticeably aiming itself at a predominantly female audience it is a sensible marketing ploy to try and engage that part of the female audience that now has a Doctor of their own. Doctor Who: The Women Who Lived (2018. 223 page) is a large format book consisting of both pictures and text which celebrates all of the women who have appeared on the show. I say all, there have been many, I’m guessing hundreds since the show began, so the editors have had to make choices on who to include. The book is edited by Christel Dee who is the main host of Doctor Who: The Fan Show and Simon Guerrier, a novelist who has worked heavily in the Who universe. The entries go all the way back to 1963 and the introduction of Susan (Carol Ann Ford), the Doctor's granddaughter and Barbara Wright (Jacqueline Hill), his first female companion. The book ends with Whittaker as the Doctor and Yasmin Khan (Mandip Gill), her most current female companion. The main bulk of the book covers seventy-four female characters, which have appeared in the show. The characters are presented in alphabetical order and not in the order in which they appeared, nor is there an effort to distinguish them by their relative importance. There are also some honourable mentions and one for Verity Lambert, who did much to create the show. Each character gets a full page illustration from twenty-one different female artists. They have been allowed artistic licence in how they portray the characters. The stylistic choices range from manga to realism and everything in-between. For the most part the portrayals are interesting, even when not realistic, but there is the odd stinker in there. Each character is identified by their name, who played them, their occupation and the first episode they appeared in. You also get a page or two of basic information about their appearance and story. For a long term Who fan, male or female, apart from the original illustrations there is nothing deep or revolutionary here. The overall feeling I get is that this book is designed for quite young girls, possibly new to Who, as in many cases; the actresses are portrayed much younger than they were in the show. Plus the type of information is at a level to consider this an introductory text to wider parts of the show. 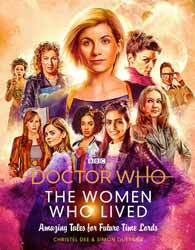 Still, it’s a laudable ambition to want to provide females with their own non male centric information which celebrates women’s contribution to Doctor Who.